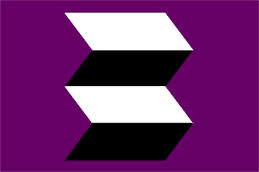 Although the company was better associated with the S.E. Irish port of Waterford, it originated in Dublin. George Bell & Company (Dublin) Ltd. was incorporated on 28th August 1936, although from available sources, it is unknown if any previous names were used. Bell, were forward thinking, seeing the potential of the growing container / unit load system of transportation. In 1964 they entered negotiations with liner service operator Clyde Shipping Co. Ltd, of Glasgow with a view to inaugurating a partnership service for the transportation of palletized and containerised goods between Ireland and mainland UK (Waterford – Mersey). Within a year they had also entered into collaboration with Atlantic Steam Navigation Co. Ltd, from Preston. Over the next decade or so, the network developed, with further route additions; London’s Victoria Deepwater Terminal, later moved to Harwich Parkeston Quay and Radicatel on the Seine near Le Havre served routes to Teesport, Newport, Waterford. The company once again had stretched finances to the limit with their recent investments and then Mother Nature struck the death knell when a severe storm crossed Waterford in 1996. The wind strength was such that it moved one of the container cranes which had not apparently had its parking brakes applied, causing it to derail and topple onto an adjacent crane, wrecking both. This event instantly closed the Belview terminal and with finances at their low level, the company had no quick fix available to them pending insurance settlement and repairs to the facility. Such was the plight of the business, it warranted discussion in the Lower House of the Irish Parliament in February and July 1997 but despite the talking, no assistance was offered. The Dutch parent meanwhile had as part of a survival package, been busy trying to re-finance and had created a new holding company in Dublin, Taigro Ltd, which took ownership of some vessels pending a decision on the future of the business. There was tentative interest shown by the Irish Continental Group, reportedly a major shareholder, in acquiring the remainder of equity but container operations was not really within their primary field of ferry operations. 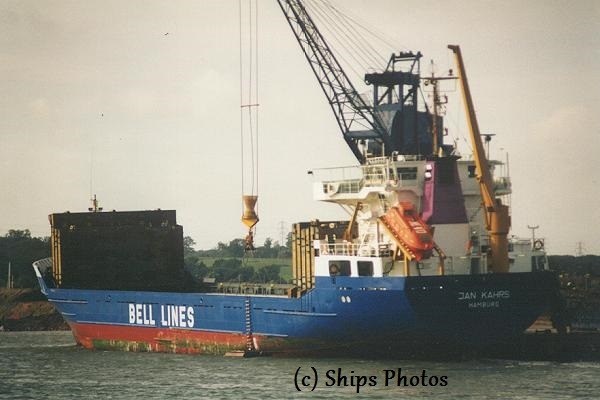 No rescue was therefore forthcoming so by August 1997, after thirty five years and having employed around sixty vessels, the Bell Group folded with the loss of 100 jobs in Waterford alone. Ilha Da Madeira (1996) Basel S3 (2014). Inishowen (1996) Gera (1998) Arfell (2001) Gera (2003) Vera (2003) Marti Pride (2006)Princess Sira (2008) Montaser M (2011) Taknis (2014) (2014) Amazigh S1. 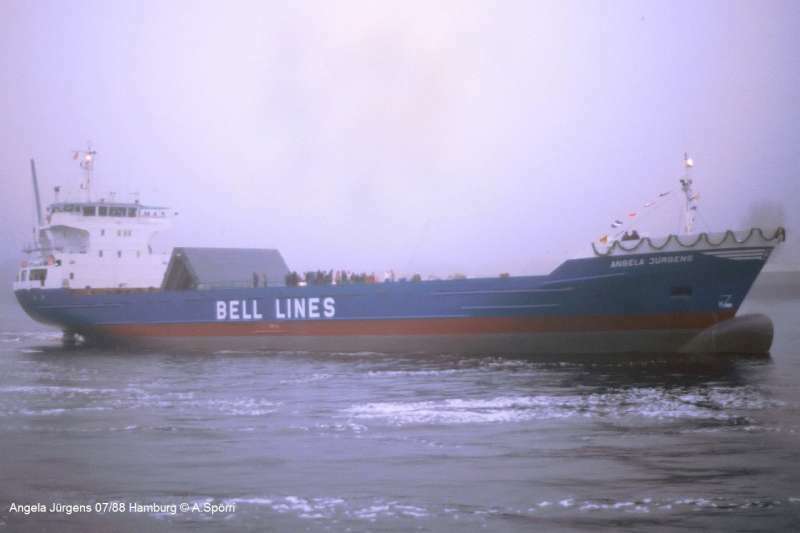 10.10.1989: Keel laid by Teraoka Shipyard Co. Ltd.
1991: Sold to Euro Container Shipping plc., Dublin. 1996: Sold to Taigro Ltd, Dublin. 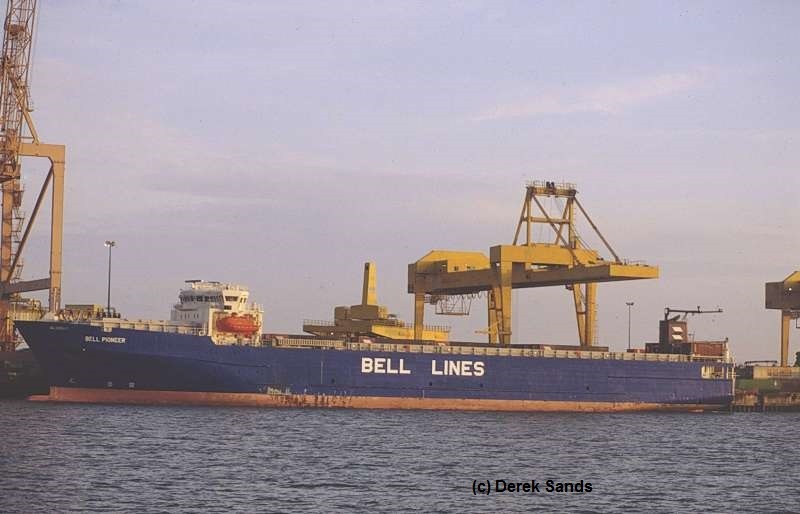 1997: Sold to Brightstone Shipping Co. Ltd, Cyprus,renamed Ultra Contship. 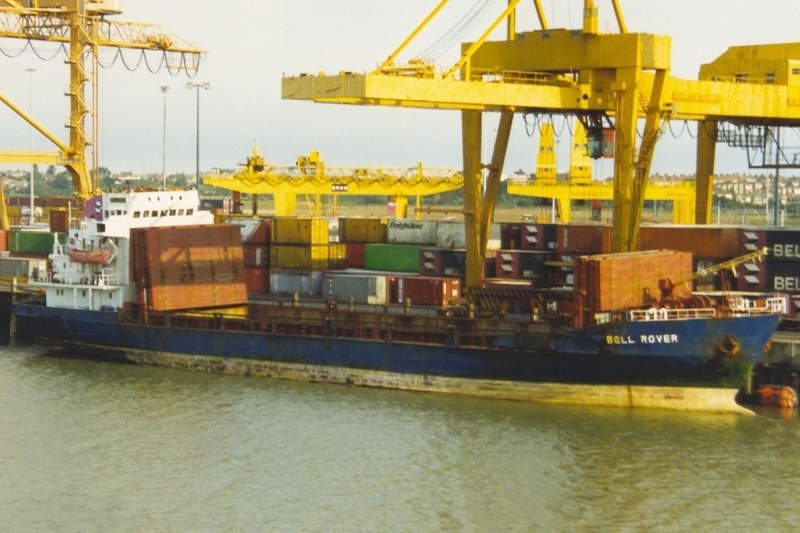 1998: Sold to Container Shipping Co. Ltd, renamed Mf Ranger.2000: Renamed Ultra Container. 2001: Sold to Tropic Sea Co. Ltd, Malta renamed Zim Novorossysk I. 2004: Sold to Talita Shipping Co. Ltd, Malta renamed Alcione. 2009: Sold to United Group Shipping Co, renamed Egy. 21.05.2014: Arrived at Aliaga for demolition by Ege Celik Gemi Sokum. 25.10.1976: Keel laid by Kagoshima Dock & Ironworks KK, Kagoshima . 1977: Completed for Bell Lines Ltd, Dublin. 1991: Sold to Euro Container Shipping plc, Dublin. 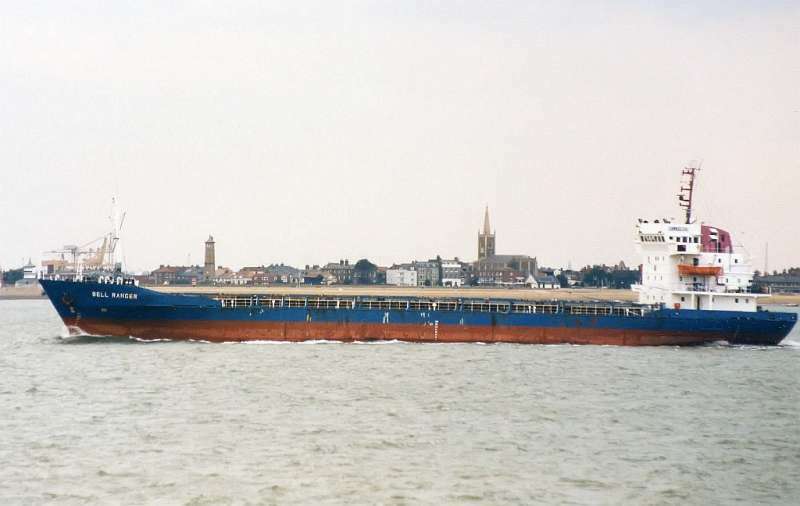 1997: Sold to Blue Sky 1 Maritime Ltd, and renamed Blue Sky I. 2000: Sold to Xin Chang Shipping Ltd, and renamed Xin Chang. 11.07.1977: Keel laid by Kagoshima Dock & Ironworks KK, Kagoshima. 01.12.1977: Completed for Bell Lines Ltd, Dublin. 1979: Sold to James Fisher & Sons plc, Barrow in Furness. 1988: Sold to Airmores Shipping Co. Ltd, Malta, renamed Laura. 1994: Sold to Naviera Polovina SA, renamed Laura I. 23.08.1976: Keel laid by Kagoshima Dock & Ironworks KK, Kagoshima . 24.12.1976: Completed for Bell Lines Ltd, (Horst Zeppenfeld), Dublin. 1978: Sold to Erich Johannes Hanisch. 1994: Swift Navigation Co. Ltd.
1996: Sold to Royal Agencies Corp, Panama and renamed Als. 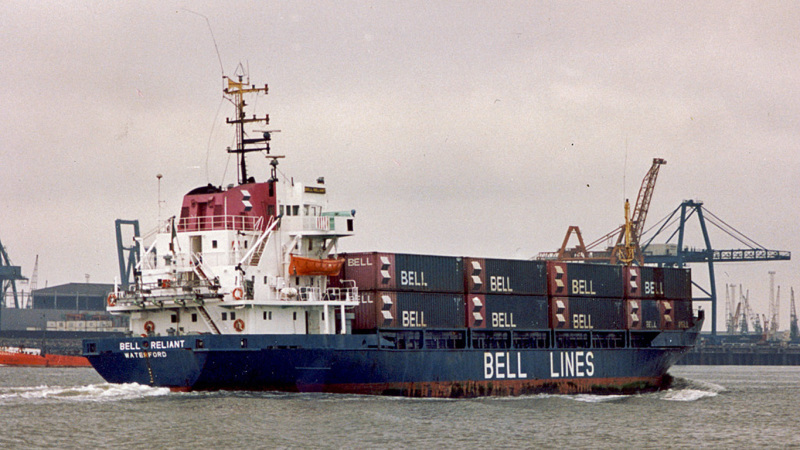 1996: Sold to Perma Line SA, Panama, renamed Perma Glory. 2004: Renamed Mataf Star . 2005: Sold to Bahregan Marine Services Co, Iran. 2013: Sold to Mahan Oghyanous Co, Iran and renamed Moshref. 23.02.1978: Keel laid by Kagoshima Dock & Ironworks KK, Kagoshima. 25.08.1978: Completed for Bell Lines Ltd, Dublin. 1979: James Fisher & Sons plc, Barrow in Furness. 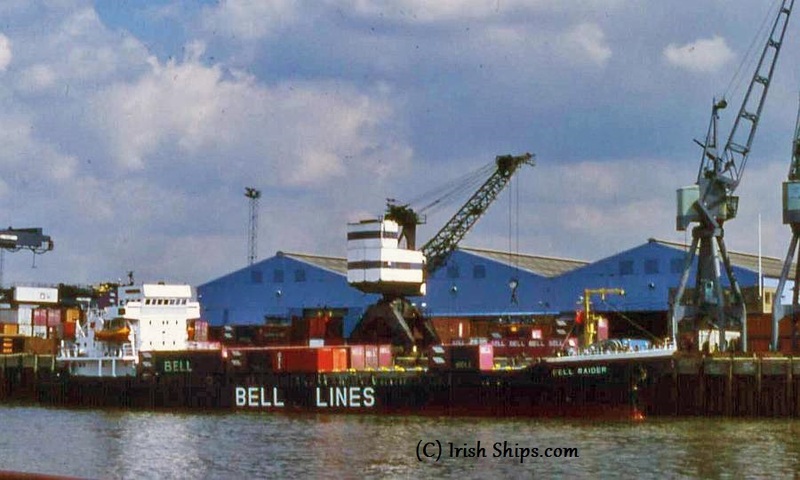 1991: Sold to Bell Ship Management Ltd, Dublin. 1991: Sold to Alcalufes Navigation Co. Ltd, Malta and renamed Erizo. 21.12.2001: Arrived for demolition at Bahia Honda, Cuba. 22.12.1977: Keel laid by Kagoshima Dock & Ironworks KK, Kagoshima. 25.02.1978: Launched. 24.04.1978: Completed for Bell Lines Ltd ,Dublin. 1991: Sold to Alcalufes Navigation Co. Ltd, Malta, renamed Ola. Sold to Naviera Latino Americana SA, Nicaragua. 09.01.2006: Whilst on a ballast voyage from Nuevitas to Havana, at 20:15hrs , suffered failure of No.1 cylinder head in main engine and anchored in heavy weather for repairs. Anchor dragged and crew removed by shore based coastguard team. 10.01.2006: At 03:20 hrs. driven ashore and stranded at Punta Goleta, Gibara, Cuba. abandoned in situ. 23.01.1978: Keel laid by Kagoshima Dock & Ironworks KK, Kagoshima. 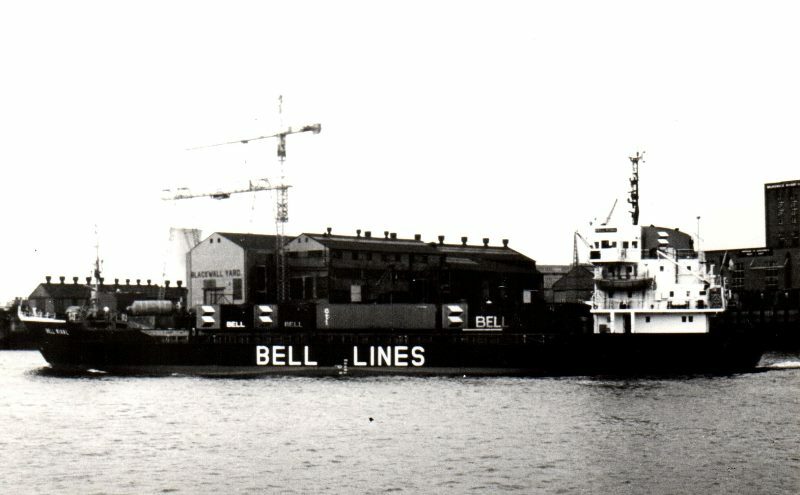 23.06.1978: Completed for Bell Line Ltd, Dublin. 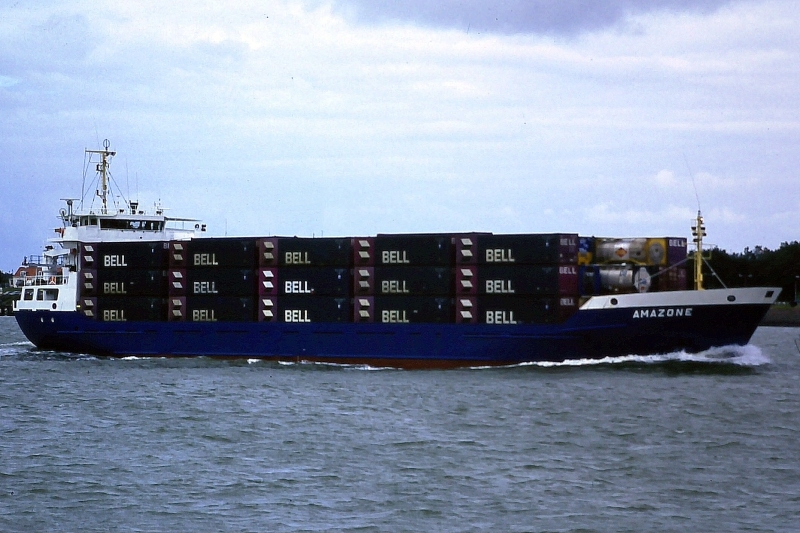 1993: Sold to Fareast Brilliant Shipping Co. Ltd, and renamed Fareast Brilliant. 1995: Sold to China Government, Fujian Province and renamed Hua Jie. 2008: Sold to Pioneer Group (Hong Kong) Ltd, renamed Hai You. 2010: Sold to Hontix International Ltd, Hong Kong, renamed Ocean Win.2011: Sold to Vision Shipping Ltd, Hong Kong. 02.11.1977: Keel laid by Kagoshima Dock & Ironworks KK, Kagoshima. 24.02.1978: Completed for Bell Lines Ltd, Dublin. 1982: Sold to Maretainer Eggers Schiffahrts KG, Hamburg and renamed Maretainer. 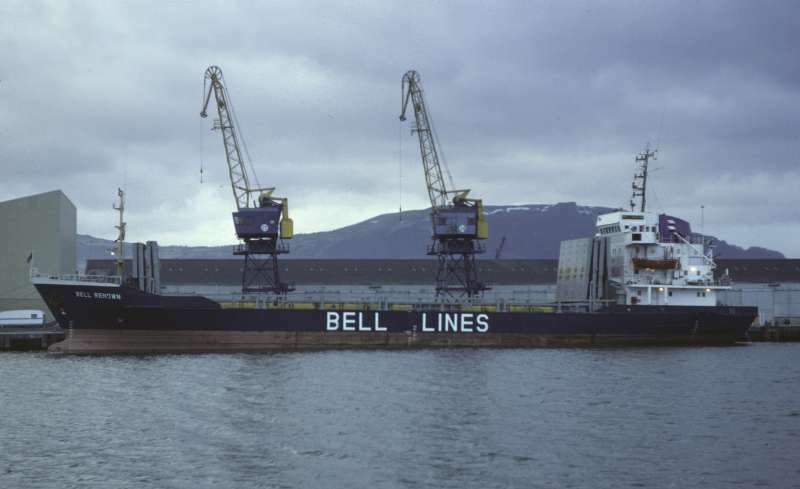 1985: Sold to AS Nevi, Kristiansand, Norway and renamed Lynette. 1988: Sold to Conto AS, (Paal Wilson Management AS, renamed Conto. 1991: Sold to Coral Queen Shipping Co Ltd Cyprus, renamed Island. 1992: Sold to Hua Tung Maritime Inc, Liberia, renamed Fareast Fair.2006: Sold to Shantou Shunhai Shipping Co. Ltd, renamed Long Tai I. 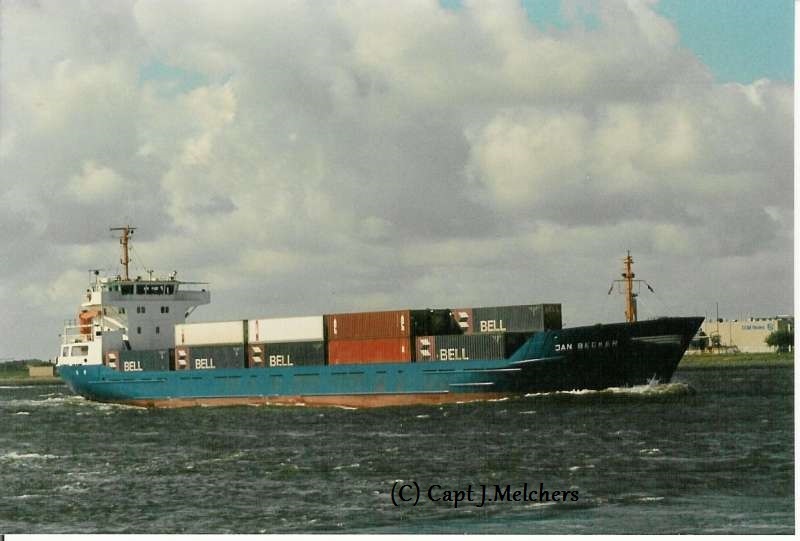 2008: Sold to Sea Wide Shipping Company Ltd, renamed Hai Fu. 07.09.1976: Keel laid by Kagoshima Dock & Ironworks KK, Kagoshima. 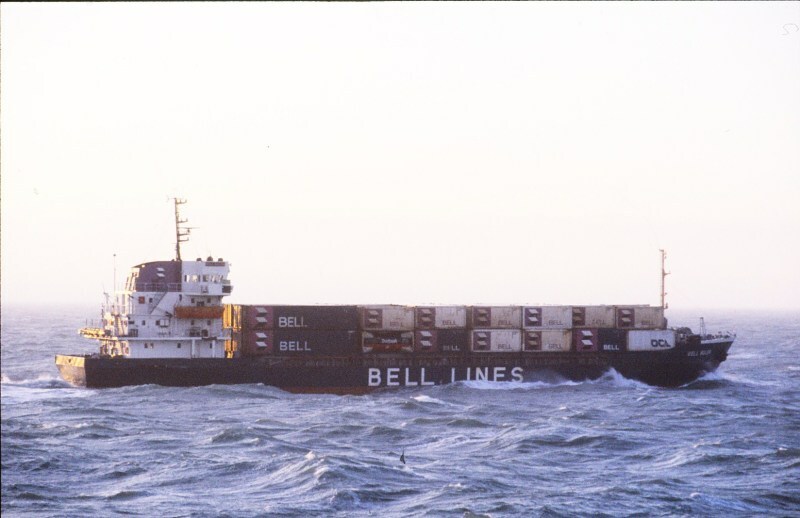 31.12.1976: Completed for Bell Lines Ltd.
1991: Sold to Euro Container Shipping plc. 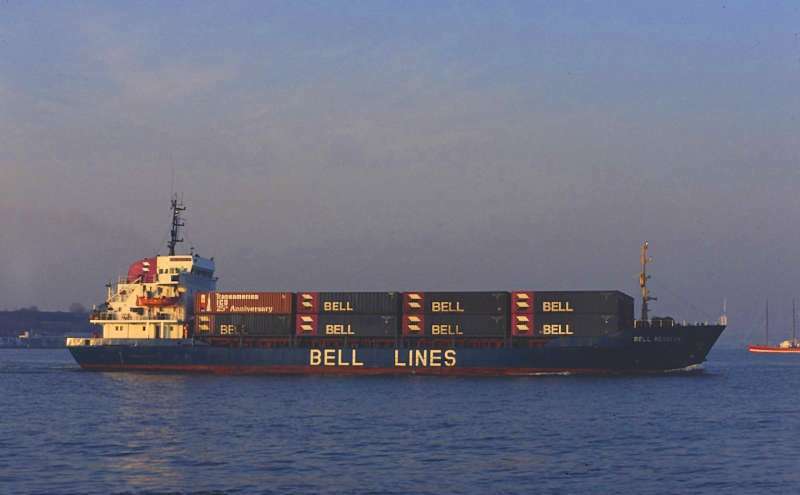 1993: Sold to Zhong Yan Maritime SA, renamed Ling Feng. 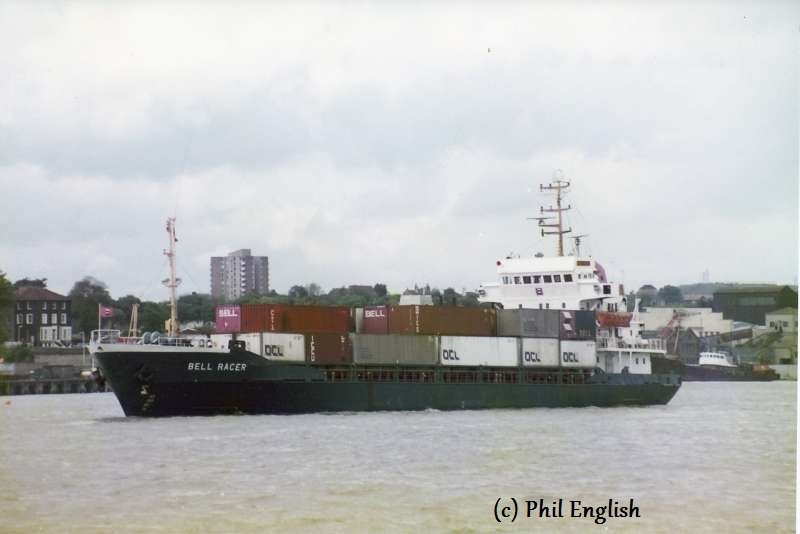 1998: Sold to Yong Zhao International Shipping SA, renamed Hai Lin Fang then Hai De Li. 09.12.1976: Keel laid by Kagoshima Dock & Ironworks KK, Kagoshima . 30.04.1977: Completed for Bell Lines Ltd, Dublin. 1997: Blue Sky 2 Maritime Ltd and renamed Blue Sky 2. 1998: PSC inspection – detained..
01.01.1999: Reported as to be broken up at Xinhui but continued in service. 2001: Shantou Desheng Shipping Co. Ltd, and renamed Hai Xiang Tong. Vantage (1978) Corinna (1993) Gloria T (2004). 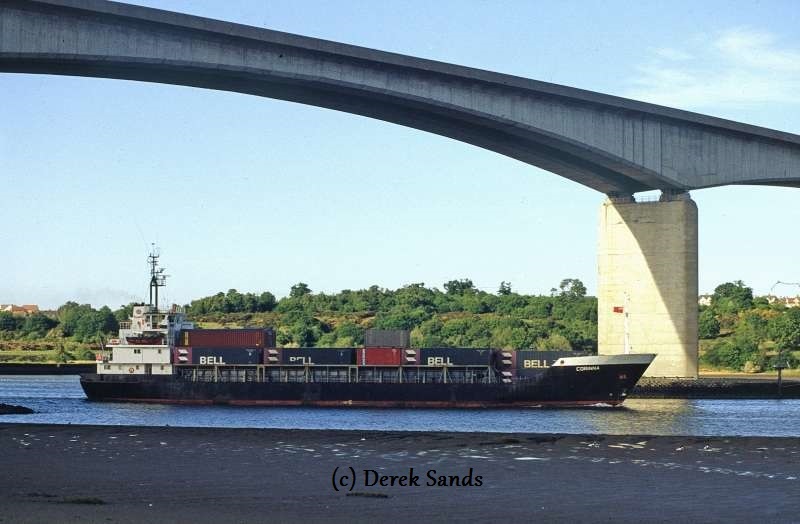 Photo by permission of Derek Sands seen as “Corinna” passing under the Orwell Bridge after leaving Ipswich on the 26th May 1995. Triton Loga (1998) Mosa (2006) Dan Supporter (2007) Syros Wind (2014). First call Parkeston Quay, January 1989. Sold and renamed Jan Caribe (1998). Derek Sands, Jan Melchers, Phil English, Bill Harvey and all those that have allowed use of their photos.